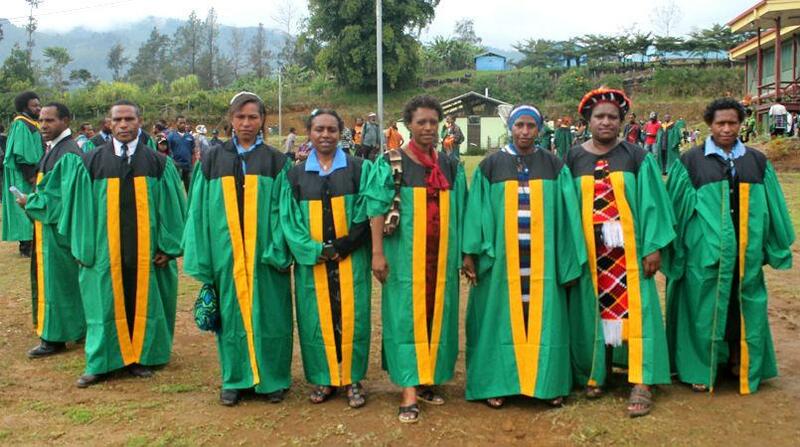 The graduation of 50 more elementary school teachers this month from Enga Teachers’ College will help improve teacher numbers and learning for students in elementary schools throughout Papua New Guinea. The graduates were proud recipients of Certificates in Elementary Teacher Training, which qualifies them to teach in Papua New Guinea’s elementary schools, where students are educated from Kindergarten level to Grade Two. Among teacher graduates were 10 women who completed their training through ‘Australia Awards Pacific Scholarships’, which are funded by the Australian Government for training at select institutions in Papua New Guinea. Enga Teachers’ College principal Michael Homingu said the addition of the new and professionally qualified teachers will be enormously beneficial for young children, as the first three years of a child’s education are vitally important. “During kindergarten and from the ages of one and two, children learn a lot of basic skills that we take for granted. But these skills are essential for the child’s future,” Homingu said. “At elementary school, while beginning to learn the alphabet and numbers, students are also learning how to socialise with others, share, work as part of a team, persevere and care for others. These are essential qualities which will help them to succeed in the future. “That is why good teacher training programs like those at Enga Teachers’ College are so important. They help ensure our young children are getting taught by trained and skilled professionals,” he added. Australian High Commission Counsellor (Education) Suzanne Edgecombe, who attended the graduation, told graduates: “If the education you give your students is the building block on which prosperity is based, then you are the engineers and architects building a brighter, better future for your province and your country. “That is why Papua New Guinea and Australia have worked together to provide in-country Australia Award Pacific Scholarships to 10 of today’s people awarded Certificates in Elementary Teacher Training. Our partnership is based on decades of cooperation and a joint commitment to a prosperous and secure Papua New Guinea. “Australia’s support to the Papua New Guinea education system – including these 10 scholarships – is helping the country to reach its vision of a smarter, wiser, fairer, healthier and happier society by 2050. This cooperation and vision for PNG’s growth is at the heart of the Australia-PNG relationship,” she added.